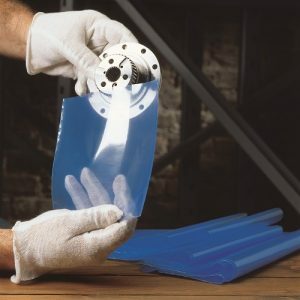 Premium Metal-Guard VCI poly film recloseable bags provide effective corrosion protection for metal parts during storage and shipment. Constructed of clear film colored Daubert blue, our VCI poly bags allow for easy inspection without opening each package, while the zipper top opening provides quick access when needed, without the need to rewrap parts remaining in the bag. Order before noon CST for same-day shipment. Our Premium Metal-Guard VCI poly bags are a great answer when you need to keep ferrous and non-ferrous metals clean and dry, ready for immediate use without additional cleaning or treatment. Premium Metal Guard VCI poly bags are also available in flat and gusseted types. Visit our Quick Ship store now to view the full line of our available VCI poly bags.